Indian fast food is one of the most popular takeaways, and it’s been said by many a survey that in fact a chicken tikka masala is actually the most popular dish in the UK! Although it’s delicious, and some of the choices can actually be quite healthy, a western style Indian takeaway bears little or no resemblance to traditional Indian food, which is by and large vegetarian and can be very healthy. Westernised Indian food has evolved to suit the taste buds of the average westerner, and so in doing this, the meat, salt and fat contents have all increased. 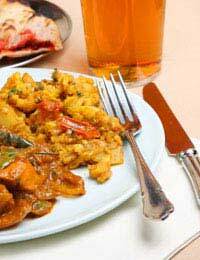 There are still ways that you can enjoy an Indian feast without doing too much damage to your waistline though! Whats Bad About Westernised Indian Food? That Chicken Tikka Masala mentioned above may well be the nation’s favourite, and it’s certainly absolutely delicious, but so it should be with a whopping 860 calories and 47 grams of fat (over half of the recommended daily maximum) in one serving, if you have it with pilau rice. It's also the saltiest Indian dish. One portion gives you five of your six daily grams of salt too. Some of the other favourites on the Indian takeaway menu are just as fatty – anything that comes in a korma, passanda or masala sauce will generally contain oil, cream or ghee (which is just clarified butter). If you just can’t resist the temptation of a creamy korma or passanda, spoon the meat and vegetables from the container and eat less of the sauce. The sauces are where the hefty fat and calorie count come from. What are The Healthier Options on an Indian Fast Food Menu? If you want to save on calories and fat, look for the tandoori dishes or tikka kebabs, which are baked in the oven and not covered in a rich, fatty sauce. Other good choices are chicken dupiaza or perhaps a prawn madras. Any of the vegetable dishes will be better for you as they also pack a nutritional punch with the vegetables included in the sauce, so you could opt for a vegetable balti, a dahl (lentils) or aloo gobi (the potato and cauliflower curry) with plain boiled rice, and you’ll have a filling main course without the extra fat and calories. A biryani can also be a good option when you’re trying not to over eat, because the rice and the curry come as one dish so you don’t get tempted into buying another huge portion of fried rice to go with your meal. Side Dishes And Extras – What Are The Best Options? The poppadums are delicious, but for what they are, they cost dearly in fat and calorie content. Swap a poppadum for a fat free chapatti, and when you choose your naan bread go for a plain or a garlic version instead of the keema which contains processed spiced meat, or the peshwari naan which is filled with coconut, almond and sultana. Delicious they may be, but even a plain naan can contain 400 or more calories and 20 grams of fat so share one with a friend.